I love that episode! Ninja Pizza rocks! My friends and I toyed with the thought of openning up a Pizzeria shop and calling it "Ninja Pizza"! It was a funny idea years ago, but now that we're older, we're actualy putting some serious thought into it. Thanks again for the awesome pics! Hey--could somebody get some screens of April &amp; Splinter from the Red Sky episodes? Thanks in advance! It's there. 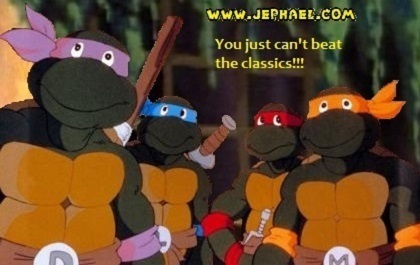 Just go to TMNT TV on the left side of the page, scroll down to Episode Guide for the original toon (under the old school logo) and click the link. It'll take you to all ten years of the show. From there you can click each individual year and read all the episodes. I believe (correct me if I'm wrong) Red Sky is from 1995 on. Hehehehe! The picture of Kala and Mikey over on page 1 reminds me of Rudolph the Red-Nosed Reindeer and the Abominable Snowman from the Rankin/Bass special! Their eyes, especially. I'm not gonna ask for requests just yet because I skipped pages 2-3 and need to see if there's any already up that I might ask to see. Cool screenshots, by the way! Close. Season 8 started in 1994 and that was the beginning of the red sky episodes. Then season 9 in 1995 and finally season 10 in 1996. Ah. I knew it was something like that. I'm ashamed to say that when Red Sky started, I kinda fell away from Turtles for a little while. But now I'm back, stronger than before. Never to sway again! I remember loosing my interest with the Ninja Turtles back in 1997 around the time Next Mutation aired. The show only caught my interest for afew episodes, but then when I realized how horribly campy it was, I got bored with it. I remember loosing my interest with the Ninja Turtles back in 1997 around the time Next Mutation aired. Yeah, my interest was going before the Next mutation came out. I was excited that the next mutation was released though, introducing TMNT to a new generation, and I bought the four turtles figures. I watched a few eps, but that's about it. We'll have to get a next mutation screen cap thread up in July. When TMNT was getting low on popularity, I stuck close to the Archie series, something I was really attached to. It was almost an obsession when I longed to see the next book every month! For awhile, I lost interest in the cartoon because I didn't care too much for Lord Dregg and Carter and such. Hey do you have the episode the Old Switcheroo? If you could post the parts where they switch and LOTS OF the shredface parts!! those are so plenty in that episode-- there's lots of great fight scenes/poses in it as well! It has to be my favourite episode! I reeeeally love that shot where Shredder (splinter) looks at his reflection on his armour! Oh, and from the same episode, try to get a snapshot of Leo pulling April out of the man hole. I'm curious to see if he did it carefully, but it went so fast, it was almost like he took one hold and nearly sent her flying! Heh, that would have been funny. Could someone please post pics of the Technodorme and of the title screen of the 5 first eps? hey do have someone have more caps of the episodes The Return of Dregg and The Beginning of the End of Leo capsurden in that ckistal cel and how he is transeformd in that monster ? You can find some pics of the Technodrome on page three of this thread. If you need others, we can get them. Unfortunatly, I can only get caps from DVDs, so I can't help out with the other episodes just yet. Hopefully, Artisan will continue to release our TMNT to us. Funny how they accidently colored Leonardo's Mask, elbow bands, knee bands, and wrist bands orange! You'd think they'd get the other one of Leonardo mixed up with Michaelangelo! I mean, he had his swords in one of those shots! Yes, someone messed up pretty badly in the coloring department. I guess no one gave them the memo of the different colors of each turtle. Leo with the pizza is somewhat believable because you can't see the initial on his belt. Mikey, with swords, on the other hand...maybe he was practicing with his brother's weapons! Yeeeeeah, that's it.